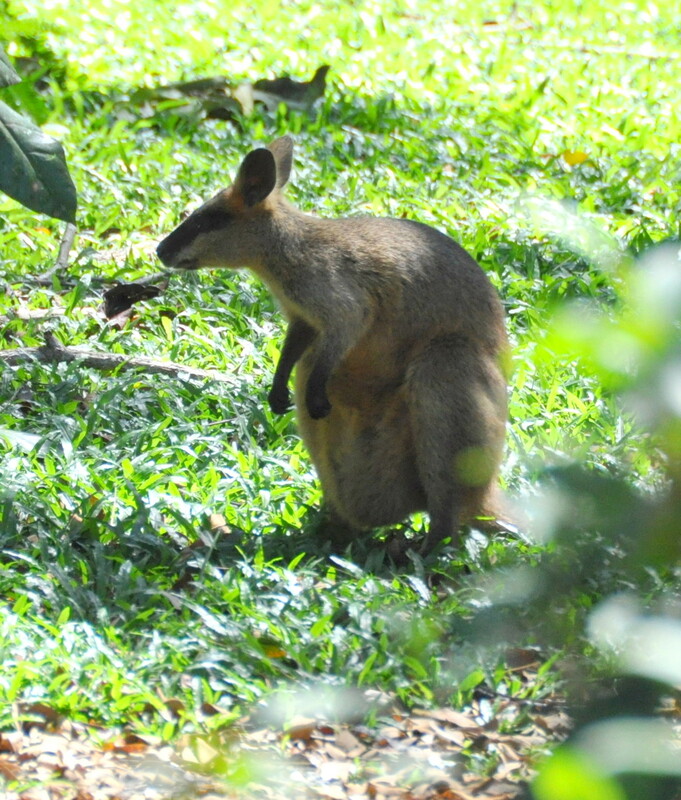 Swamp Wallaby (Wallabia bicolor) are found all along the east coast of Australia, from tropical rainforest to cool-temperate woodland. 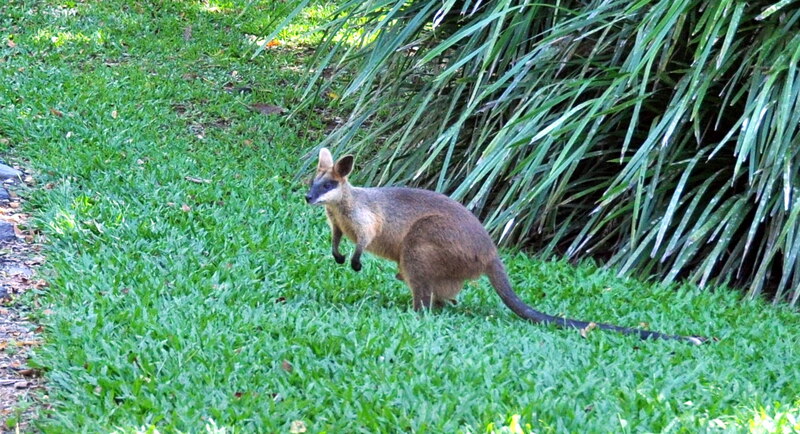 As they do not live in mobs it is quite usual to observe … a single animal, or mother with joey at foot. Wild Wings & Swampy Things has become more attractive for our local “Swampies” as we have gradually restored suitable habitat and attempted (mostly successfully) to keep it a ‘ dog-free zone’. There is one particular female who has become quite used to us and doesn’t bound away in fright when we disturb her. Early this afternoon, when according to the book she should have been sleeping, she decided to explore the perimeter of the house garden. Some of the garden beds have an understorey of native grass but Swampies prefer to browse on a wide range of vegetation and she was eating some of the weeds – marvellous, she can come again! We have had several very wet days – 142mm in 3 days which is extraordinary for this time of year – and although Swampies usually browse on shrubs, grasses and ferns during the hours of darkness, she was probably needing to feed after such inclement weather. And she has another reason for needing to keep up her nutrition – yes we did see a little head poke out of the pouch for a moment but the photographer was over excited and not concentrating very well. I’ll do better next time! 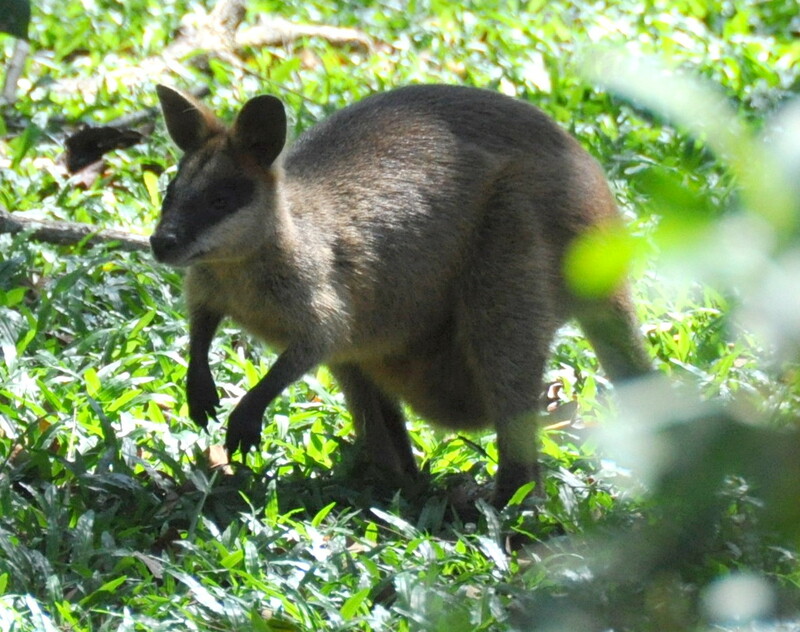 This entry was posted in Daintree Mammals and tagged Swamp Wallaby. Bookmark the permalink. Lovely! and congrats on an environment that is obviously getting better and better. It must make you very happy to see what you are creating around your place. Thanks Mick – although we’re not on a big property we are close to the Dagmar range of the Greater Daintree National Park and that certainly is an advantage. As you’re a real Swampie it seems quite natural that others would be attracted. However your territorial range has now extended to the top of Mt Sorrow so I’ve heard and that is well beyond the range of other Swampies. You’re a free roaming sub species. Well – only a brother would make a comment like this! !